Hedgehogs sleep in burrows or other dark places in the wild. Almost every small animal will find a warm, cozy place to sleep and hide in order to stay warm and avoid predators. 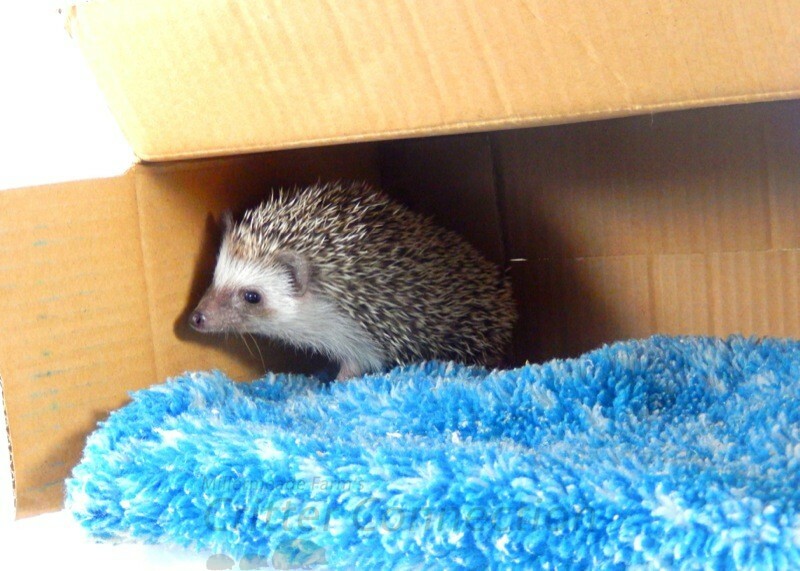 Most breeders believe it is beneficial for the hedgehog’s well being to have a warm and comfortable place to sleep. When hedgehogs are warm and comfortable they tend to sleep better and are less nervous while they are sleeping or resting. 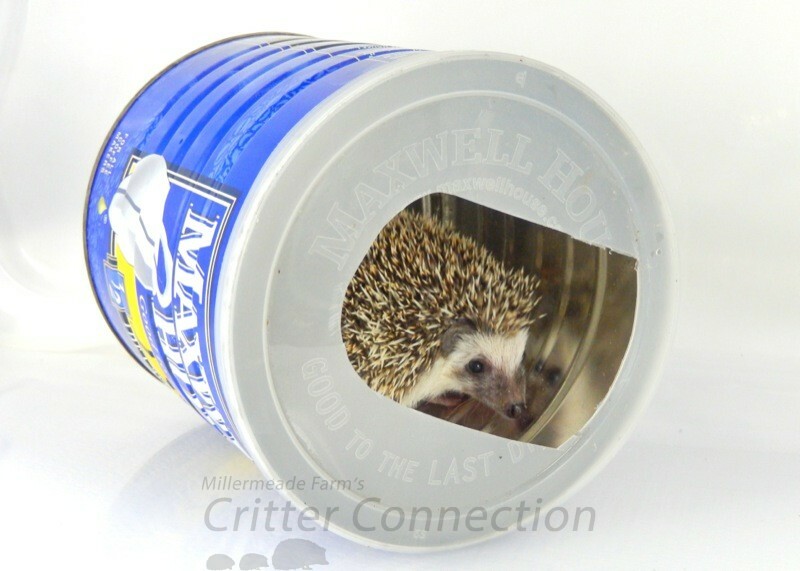 Hideouts should have an entrance and an exit (tunnel) or it should be large enough for the hedgehog to turn around. Hedgehogs usually turn around rather than back out of a tight spot. Fleece sleeping bags are warm and snuggly and most hedgehogs enjoy them. 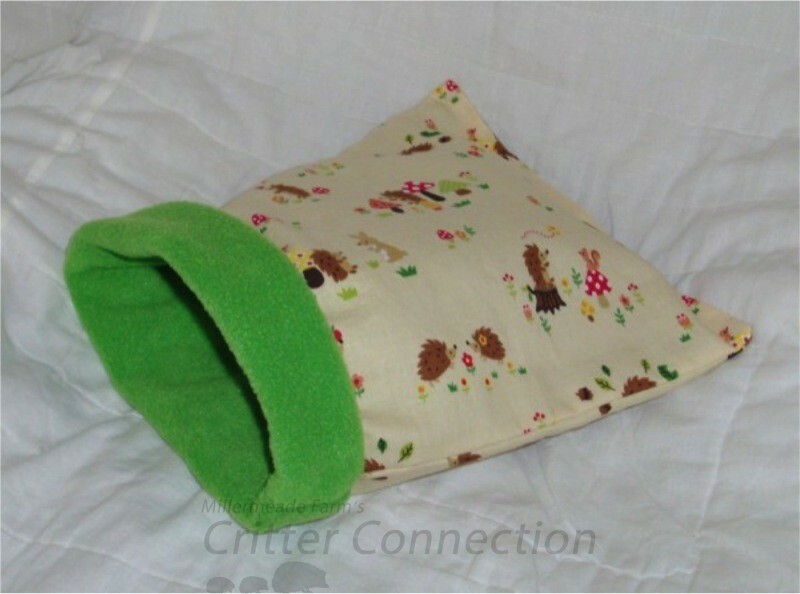 Some sleeping bags have a stiffener in the top so the bag remains slightly open which allows the hedgehog easy access inside. It is a good idea to have multiple bags because, more than likely, the hedgehog bag will get dirty and need to be washed. Dirty bags may also become a breeding ground for bacteria. Remember to wash the bags in a mild detergent and not to use any fabric softeners. The fragrance can be overwhelming to a hedgehog snuggled in such a small place. Some hedgehogs might prefer to sleep under or on the sleeping bags instead of inside, but as long as the hedgehog is happy, the bag is a useful accessory and serves its purpose. A sleeping bag also works very well to carry your hedgehog, hold them while watching television or reading a book. Igloos made from hard plastic are another great cage addition. The cave like structure allows the hedgehog to feel safe and hidden. Plastic igloos are easy to clean and sanitize. If your enclosure does not have a roof, watch your placement of the igloo in the cage. 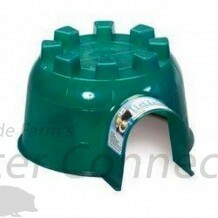 Some hedgehogs have been known to use the roof as a launch pad out of the cage. 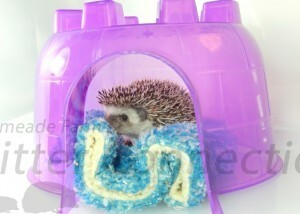 Some hedgehogs will drag their sleeping bags into their igloos for an extra cozy sleeping spot. The sleeping bag inside the igloo will provide burrowing opportunities for your hedgehog or it will make a soft, warm bed if your hedgehog chooses to sleep on top of the bag. Hedgehog hats provide a very cozy hiding and resting place. The hedgehogs are completely hidden when underneath and it provides a very dark sleeping space during the daylight hours. Hedgehogs simply use their little nose to lift the edge of the hat and scurry underneath. As with sacks, hats must be washed on a regular basis so that bacteria do not build up on the hat. Use a mild detergent and no fabric softener when washing. Check for loose threads regularly. Hats can double as a bonding tool/snuggle sack. Simply turn them over and carry your hedgehog around in them. The vellux material (soft and warm but will not shed or pill) on the inside of the hat works great inside cages that have a wood shaving substrate. The shavings do not stick to the vellux like it does to fleece. This is a great choice for a hiding spot inside a cage. One of the simplest hedgehog hideouts is an old shoe box with a door cut in one end. Some hedgehogs love the smell of leather, so nothing could be more wonderful for these hedgehogs than a house that smells like new shoes. However, one disadvantage is that these boxes cannot be easily cleaned and the flat top might become the hedgehog’s potty spot. 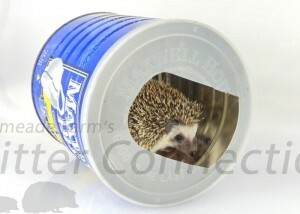 The flat box top can also give your hedgie just enough of a boost to make an escape. Be prepared to dispose of soiled cardboard. Large diameter PVC pipes can be purchased at most hardware stores. Thoroughly wash each piece and make sure that there are no sharp edges on the pipe. PVC pipes can be easily cleaned and one can connect several pieces to make a lengthy tunnel. The biggest disadvantage of PVC pipes is that it is difficult to get your hedgehog out of them without “dumping” them. Some hedgehogs may not be too upset about dumping, but some hedgehogs may not like being dumped. Some hedgehogs may come out when they hear your voice (usually as a conditioned response connected with treats), but most will not come when called. 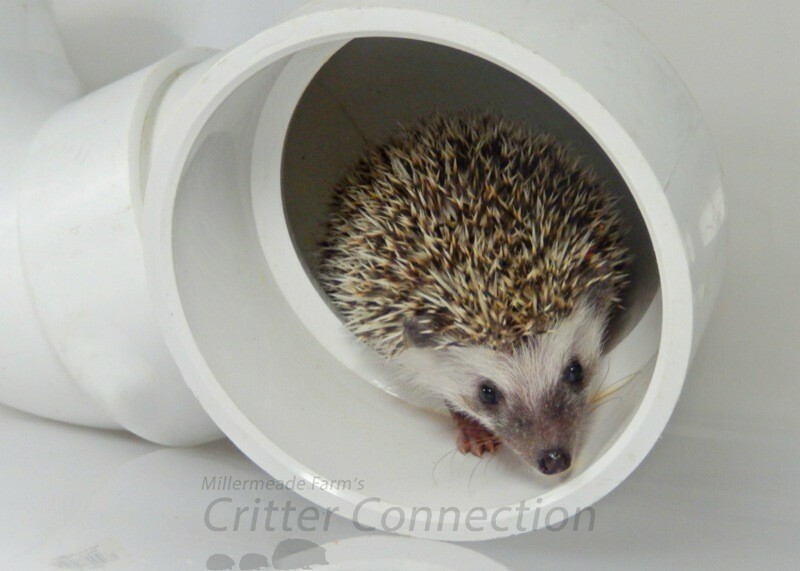 Most PVC pipes are not large enough to allow your hand to slip inside to lift the hedgehog out. There are several very cute wooden huts and boxes available for pets. Hedgehogs will not chew on the wood, but it is likely the wood will be soiled with feces. Wood products are not easy to clean and sanitize and should therefore be considered disposable. Contaminated wood can harbor bacteria that can make your hedgehog sick. Clay Flower Pots are inexpensive and are easily replaced if they crack, chip or break. Glazed or painted pots are easier to clean than porous, natural terra cotta. The texture of the flowerpot helps to wear down your hedgehogs’ nails. You can purchase various sizes and shapes. Be sure that the flowerpot is secure on its side or unable to tip and fall onto your hedgehog or trap it within the flowerpot. Plastic flowerpots can also be used as a hide, but without the advantage of wearing down the nails. These are also lightweight and may be tossed and moved about the cage or used as a climbing aid to escape the cage. Get inventive and create your own hideout! As long as the object is clean, free of sharp edges and anything that could entrap your hedgie, and is easily cleaned or disposable, give it a try! Make sure that there are no frayed edges and that the hedgehog cannot get a foot tangled in the material (e.g. terrycloth and pieces of a t-shirt or towel would be a BAD choice). 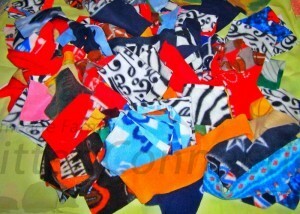 Polar fleece is relatively cheap and can be cut into big squares. Vellux has mixed reviews as a good burrowing material, so we personally would avoid it. Be sure to remove soiled fabric when necessary.